Four players signing professional contracts led the League1 Ontario top class of players coming out of NCAA play following the 2018 season, with MLS picking up three of them from the 2019 MLS SuperDraft and Hamilton's CPL club, Forge FC, grabbing a fourth. Eleven more League1 players made their presence felt in the NCAA end-of-year awards, and any self-respecting Canadian soccer enthusiast would be well-advised to keep an eye on these names going forward. Some top talent coming through the ranks! The MLS SuperDraft is always a fun party at the League1 office, with some great alumni having made headlines there in the past (ie. Cyle Larin, Richie Laryea, Kwame Awuah etc.). The 2019 edition was no less exciting with three top League1 alumni grabbed up by MLS clubs. One of their top products went First Round, 7th Overall to MLS side, Minnesota United FC - keeper Dayne St. Clair (University of Maryland/ Vaughan Azzurri) - after an incredible season with Maryland. St. Clair led the nation in keeper minutes played (2.194), was 11th in GAA (.66), was third in clean sheets (13) and did not concede a single goal in the 2019 College Cup Championship tournament. Maryland became national champions and St. Clair was selected to the 2018 United Soccer Coaches NCAA Division I Men's All-North Region Third Team before making his way to a professional contract in the draft. It must have been a fairy-tale day for the Toronto native, as St. Clair's old friend and teammate, Kamal Miller (Syracuse University/ Vaughan Azzurri), joined him on the draft list. Miller went in the Second Round, 27th Overall to MLS side, Orlando City SC. Miller also received a 2018 United Soccer Coaches NCAA Division I Men's All-South Region Third Team selection and a spot on the All-Atlantic Coast Conference Third Team. 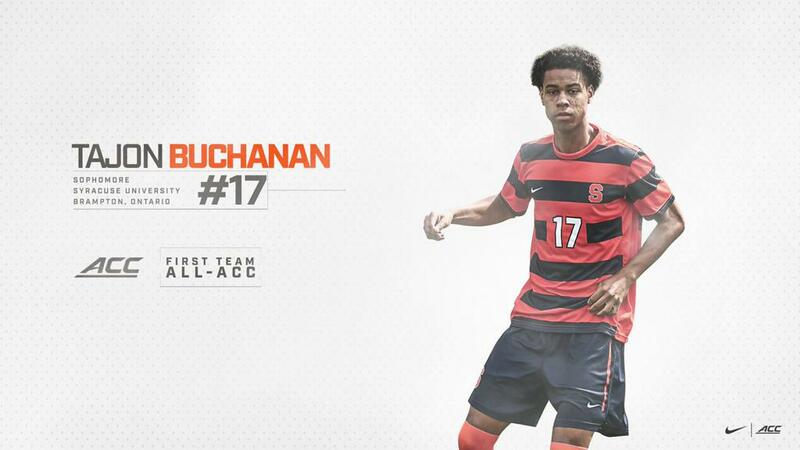 Going First round, 9th Overall to MLS club New England Revolution, Tajon Buchanan (Syracuse University/ Sigma FC) added selections to the 2018 United Soccer Coaches NCAA Division I Men's All-South Region Second Team and First Team All-Atlantic Coast Conference to his resume. Buchanan also had a former teammate sign off on his first pro papers during the post-college season, but this time the destination would be north of the border. 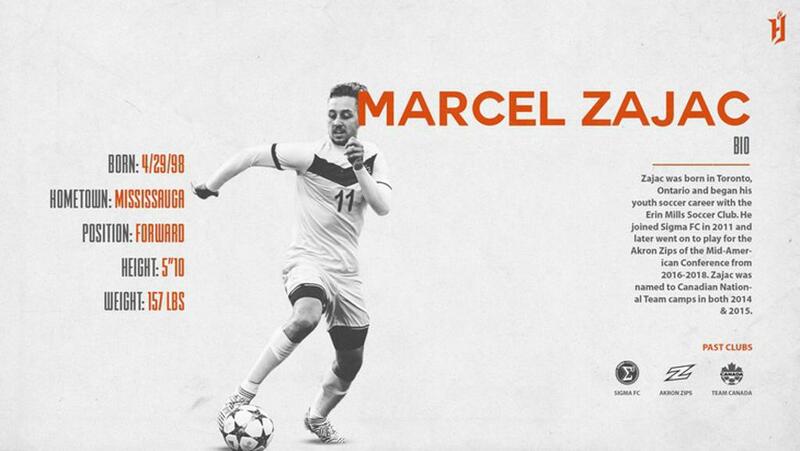 Followers of League1 will certainly know the name Marcel Zajac (Akron/ Sigma FC), whose exploits for Sigma over the years in League1 have led to many a highlight reel and All-Star distinction. Zajac had a huge year for Akron, getting named to the Mid America All-Conference Second Team, winning the MAC Conference Title (scored in 4-3 final win, his fourth goal of season) and was named MAC Conference Tournament's MVP as well to the All-Tournament Team. Zajac helped his team all the way to the 2018 College Cup Final against Maryland, just inches away from finishing his college career with a national title. No matter, Zajac joins his old gaffer from Sigma, Forge FC head coach Bobby Smyrniotis, in Hamilton after putting pen to paper on multi-year Canadian Premier League (CPL) contract. Three other League1 players - all of them from Vaughan Azzurri - lit up the end-of-the-year NCAA awards with All-Region selections from the United Soccer Coaches. 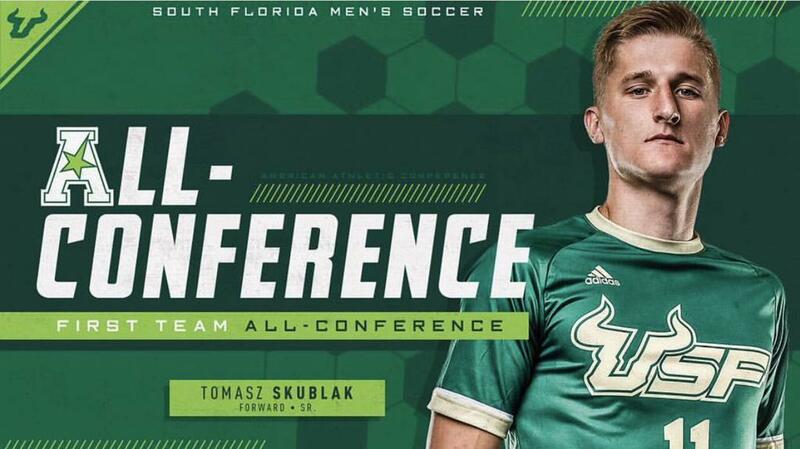 Tomasz Skublak (University of South Florida/ Vaughan Azzurri) took a place on the 2018 United Soccer Coaches NCAA Division I Men's Scholar All-America Second Team, the 2018 United Soccer Coaches NCAA Division I Men's All-East Region Third Team, and in the First Team American Athletic All-Conference side. Mathieu Laurent (University of Alabama - Birmingham/ Vaughan Azzurri) earned a selection to 2018 United Soccer Coaches NCAA Division I Men's Scholar All-America Third Team, the 2018 United Soccer Coaches NCAA Division I Men's All-Southeast Region Third Team, and Conference USA All-Conference Second Team. Dayonn Harris (University of Connecticut/ Vaughan Azzurri) was selected to the 2018 United Soccer Coaches NCAA Division I Men's All-East Region Second Team and added a Second Team American Athletic All-Conference spot to his list of individual honours. Eight more current and former League1 standouts pulled conference level awards to recognize their outstanding abilities. 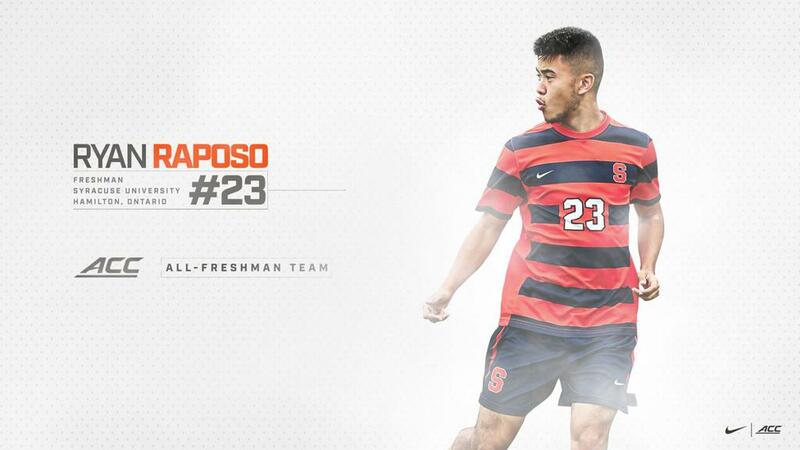 Alex Zis (University of South Florida/ Toronto FC III) grabbed a Second Team American Athletic All-Conference spot, while Ryan Raposo (Syracuse University/ Vaughan Azzurri) was named to the All ACC Conference Freshmen Team in his first year. Ryan Massoud (Northeastern/ OSU) also stood out in his freshman year, getting a selection to the All-Colonial Athletic Association Conference Rookie Team. Nyal Higgins (Oakland University/ Vaughan Azzurri) quality was recognized with a Horizon League All-Conference Second Team selection. 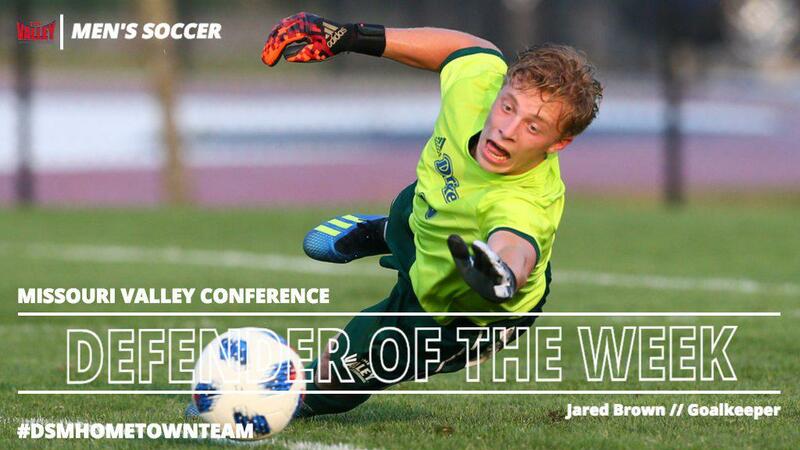 Keeper Jared Brown (Drake/ Vaughan SC) took home All Missouri Valley Conference Second Team and Missouri Valley All-Tournament Team honours, while Tom Wrobel (Bowling Green/ North Mississauga SC) showed his class on and off the field with an Academic All-MAC Conference selection. Owen Pearce (Robert Morris/ Durham United FA) was named to the Northeast All-Conference Second Team and finished first on RM Colonials for assists (4), second for points (12). Zulfikar Karimi (Maryville University of St. Louis/ Woodbridge Strikers) made his impression at the DII level, but it was enough to get a prestigious All-Region honour via the 2018 United Soccer Coaches NCAA Division II Men's All-Midwest Region Second Team.